Updated Thursday 9:50 p.m. Officials released a statement that the 3-month-old infant’s condition since she was air lifted to Primary Children’s Hospital Wednesday evening has been upgraded, but the child is still in the hospital at this time. Photos of the crash were also released. 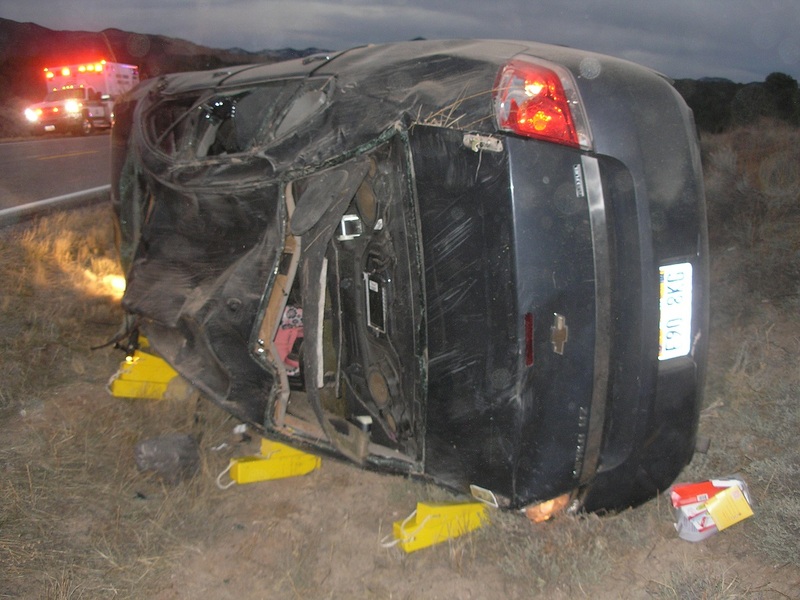 ST. GEORGE — A 3-month-old infant was flown to Primary Children’s Hospital in Salt Lake City after a single vehicle rollover in Iron County Wednesday. Just after 5 p.m. emergency crews responded to reports of a crash on state Route 56 near mile marker 38. Utah Highway Patrol Trooper Evan Kirby said emergency personnel found a badly damaged Chevrolet Impala off to the left of the roadway with a woman and two infants inside the vehicle. As the woman was driving west on SR-56 her vehicle started to drift off to the right side of the road, Kirby said. She over-corrected by turning sharply to the left, which sent the Impala skidding across the highway before hitting an embankment. The car rolled at least two to three times before it came to rest on its left side, which is where it was discovered by officers responding to the scene. SR-56 was subsequently closed for a short time while Intermountain Life Flight landed on the roadway. Troopers are investigating speed as a possible factor in this crash. “Speed seems to be a culprit in this accident,” the trooper said. Kirby said one of the infants received a head injury after being thrown from a car seat that was improperly secured in the vehicle and came loose during the rollover. “They are hopeful at this point that the infant sustained relatively minor injuries, but she was flown to Primary Children’s to make sure,” Kirby said. The mother and the other 3-month-old baby were taken by ambulance to Cedar City Hospital with minor injuries. I hope the baby recovers and is able to get home with family asap ! I had overheard heard conversation in Enterprise that one of the infants was ejected from the car. I was the first at the scene to help the driver and helped hold the babies when the driver handed them off to me from the driver side window. No one was ejected. Even though it’s reported one of the childseats wasn’t correctly mounted, I will say confidently that no one, especially the babies, would have survived that roll-over without being secured someway. Nobody wants to come up to a thing like this and I want to get a thanks to the two Hispanic guys who were next to stop and help. They pulled the windshield open enough so the driver could get out and also helped hold the babies. Several others also stopped including the cable fiberoptic guy who continued on 56 until he could get through to 911 and the two young girls who stopped and took over holding the babies.